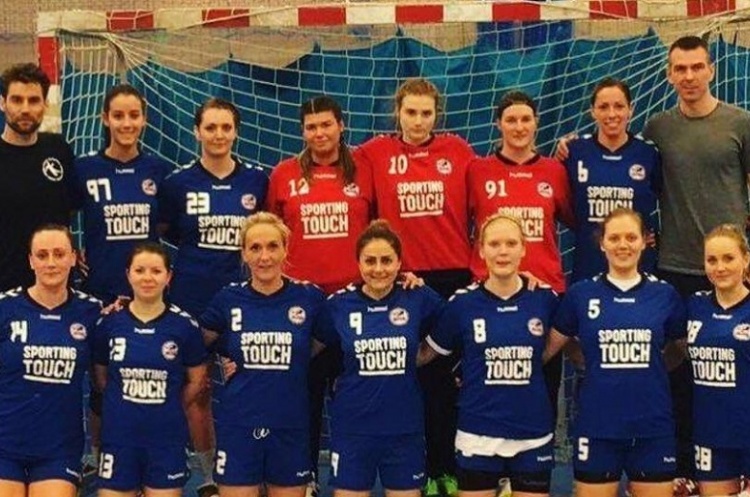 The England Handball Women’s National Cup quarter finals saw close matches across the board. Defending champions Coventry Sharks stayed on course for a potential fourth final in a row by defeating NEM Hawks 24-18. The University of Bath came through against Premier Handball League opponents Peninsula, winning by one goal in a 21-20 victory. Elsewhere, London GD II took the honours ahead of Bristol 33-13 and West London Eagles lost to London GD 26-31. Sharks are looking ominous in this competition as they defeated NEM Hawks by six goals after leading by just one at half-time. The Midlanders took a narrow lead into the break courtesy of four goals from Kristin Ivancheva and four from Marta Gutowska. Holly Lam-Moores led the scoring for the Mancunians, with four first half goals as part of her overall tally of seven. In the second half, Sharks pulled away and it was Ivancheva again, netting five times to bring her overall tally to nine for the match and her nomination as Player of The Match for the Sharks. Holly Lam-Moores was given the honours for the Hawks. Sharks head for the semi-finals full of confidence after this dominant second half display, whilst Hawks will focus on the league where they sit second. Bristol were blown away by London GD II in their quarter final, losing 13-33 as the London club demonstrated its awesome strength in depth. The Londoners, who play in the South East Regional League Tier 1, raced into a 15-6 half-time lead after strong goalscoring performances from Marie Auborg and Yessica Gomez Castano, who both netted four times in the first half. Gomez Castano followed this up in the second half with a further four goals to bring her overall tally to eight. Bristol responded through four goals from Vilma Jasilionyte, Bristol’s Player of The Match, but were unable to draw back the deficit in the second half. GD II will face Sharks in the semi-final on the weekend of 17/18 March. In the other half of the draw, the London derby was a similarly competitive affair. London GD, defeated finalists in 2017 and champions in 2015, currently lead the Women’s Premier Handball League having been unbeaten all season. Eagles, coached by former Great Britain player Paul Dempsey, are hot on their heels having lost only once in all competitions so far this season. It was a close first half with just one goal separating the teams at half time – GD with a narrow 15-14 lead. In the second half, despite Kristyna Littman netting four times for the Eagles, GD ran out 31-26 winners in part due to the efforts of top scorer Christina Rehnberg with eight goals and Arantzazu Marin, with five. Peninsula made the long journey down to the University of Bath. A tight game was level at half-time with the score at 10-10. Bath’s Ieva Diksaityte top scored for the students with five goals, and it was her final goal that decided this match by a one goal margin with a score of 21-20 to the hosts. For Peninsula, Jemaine Knott and Gabrielle Howarth both netted six times. Bath play London GD in the other semi-final on the weekend of 17/18 March. Eight teams are down to four, with an equal split of Premier Handball League teams and the best of regional talent. The teams are one step closer to the finals.